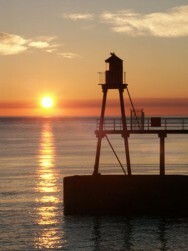 Below are the latest tide times and meteorological information for Whitby, North Yorkshire. This information is updated multiple times daily. Every year people have to be rescued from the coast around Whitby simply because they hadn't checked the time of high and low tide in Whitby. And every year, people plan a visit to Whitby and come only to find that the tide is high, and there is no beach to walk on! Don't be one of those people - bookmark this page and check it when you plan your next visit.